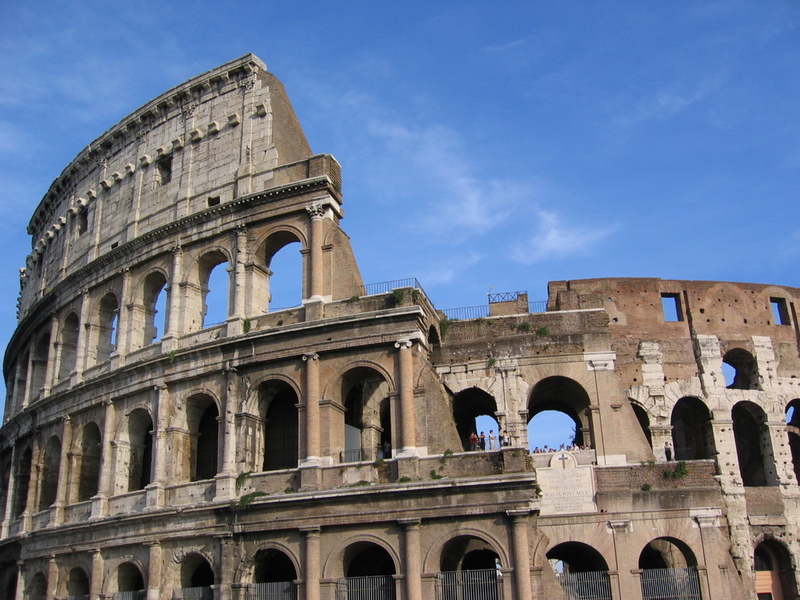 Price: from € 49.50 p. p.
You’ll see the Colosseum (inside), Roman Forum (all temples, basilicas, triumphal arches), Palatine Hill and Rome Storical Center. This tour begins at the Colosseum. Built by the Emperor Vespasian in 72 A.C. it is Rome’s greatest amphitheater and has hosted innumerable bloody battles between beasts and gladiators.The Palatine hill located here are the houses of Augustus and Livia, the residence of the Severi and Tiberius’ Domus; so named the Emperors’ residence. Thanks to its large stadium and the terraces an impressive view of the Circus Maximus can be appreciated.The Roman Forum Began as a Market place and soon became the hub of Rome for economics, religion and politics- the real historical center, with its ancient Basilicas, triumphal arches, honorary columns, ancient pagan cemeteries and the Quad leveled market.At the center of the Forum walk the same cobble-stones that have been walked for over twenty centuries, known as the Sacred Way, leading to the Capitoline Hill.The Pantheon, admired and studied by Michelangelo, a true architectonical wonder of Ancient Rome and which today it is the burial place of Raffaello and of Italian Kings.The Square of Venice, Rising at the center, is the monumental complex called Vittoriano was dedicated to King Victor Emmanuel II in 1911 and also called Altar of the Fatherland. From there, a lovely stroll will take us to Piazza Navona to cover the Fountain of the Four Rivers by Bernini and the Church of St Agnes by Borromini, while hearing about the rivalry between these two artists supposedly evident in their architecture. Another short stroll will take us to the beautiful Trevi Fountain, inspired by Roman triumphal arches, is the largest and most famous Baroque fountain in Rome. There you will hear about the abundance of water and fountains in Rome. Highlights: Visit of the Roman Forum, the Coliseum and Palatine Hill. Capitoline Hill, the Pantheon, Marcellus Theater, Circus Maximus, The Square of Venice, Piazza Navona, Trevi Fountain. Persons: Min 1- Max 10 . Price per tour: 1-2 pax € 275,00; 3-4 pax € 330,00; 5-6 pax € 385,00; 7-8 pax € 440,00; 9-10 pax € 495,00. Operated by SIT Travel Group, inc.
San Diego, CA 92103 - U.S.A.